The work plan of the project has in total 7 WPs: 2 non-technical WPs for management, dissemination, exploitation and standardization activities, 5 WPs for technical tasks. Special attention has been placed in the definition of the interfaces between the work packages that are identified in Figure 3.1 and the text below. The work has been efficiently split in order to have interfaces lean enough to allow for a high degree of independence, but sufficiently rich to exploit the synergies between the WPs and to ensure proper synchronisation. Will provide the applications, technology specifications and architectures for the solution based on a transceiver operating in D-Band. First, the different, requirements from the network point of view (uses cases) will be analysed and defined. Definition of the solution architecture and then the system requirements will be identified and defined. Then a bunch of different transceiver architectures and approaches will be studied and a set of specifications will be provided for a chosen solution. Afterwards, taking these requirements as inputs, the block architecture of the system will be defined together with the specifications of each block of the transceiver. 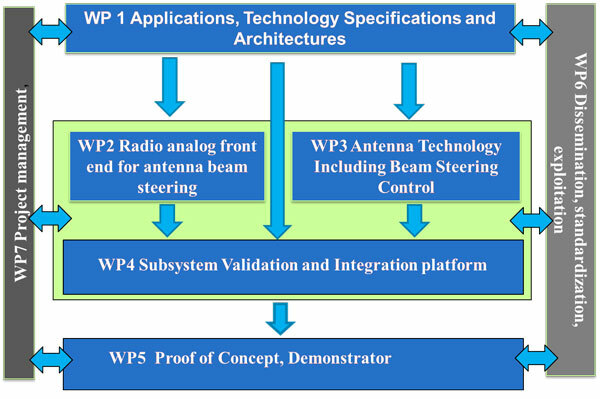 The output of the WP1 will be a basis for work in WP2, WP3, WP4 and WP5. Will cover the development of all the D-band analog frontend transceiver functional blocks required to provide cost-efficient, high data rate wireless back- and front haul radio links for the project, using the advanced 55nm BiCMOS technology of ST-I to cope with the integration of the complete D-band frontend on a single chip set. Radio analog front end functional blocks such as, IQ-mixers, low-noise amplifiers, frequency multipliers, frequency synthesizer, phase shifters and power amplifiers will be designed and implemented in SiGe technology. Design will be done based on specifications from WP1 in close cooperation with WP3 in IC die-to-antenna feeding line transition co-design. Designed, fabricated and tested chips will be delivered to WP4 for integration. Will develop the antenna elements and array integration concepts needed in the demonstration platforms. Different antenna element types for the antenna array will be studied with simulations and prototype measurements. Different beam steering techniques such as phased arrays, reflect arrays, transmit arrays and integrated lens antennas will be compared in order to select the most promising technique. Mutual coupling reduction between array elements will be studied for optimal beam steering performance. Co-simulation of antenna elements with RFICs will be done. Digital control interface for the RFICs will be also developed. Design will be done based on specifications from WP1 in close cooperation with WP2 in RF, LO and IF impedance level. Designed antennas will be delivered to WP4 for integration. Will design the testbed architecture and define the test planning. It will also build the testbed based on the prototypes of WP4. It will constitute a radio link, the demonstrator of the project, and it will be connected with a digital baseband, developed outside of the project and provided by ALU-I, in order to perform final test and validation. The work package will validate that the demonstrator fulfils project objectives and in particular the transceiver capability to implement the link fulfilling the requirements. Results of the WP5 will be used for future standardization activities in D-Band. Receives inputs from all the work packages of the project to disseminate the developed technology. Participation in D band standardization processes will be carried out by industrial partners, particular ALU-I to broadcast the results of DREAM. Exploitation plans of the project results will be developed.